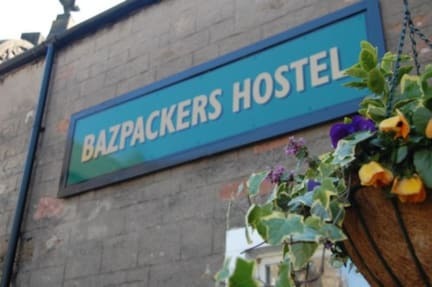 Located just in front of the Castle, Bazpackers offers clean, professional, friendly service in a quiet but very central location of Inverness. We aim to provide quality, budget accommodation for backpackers roaming the Highlands. In a converted old Victorian town house - built in 1826 - we offer 6 and 4 mixed shared dormitory room, as well as a 4-female dorm, twin and double private rooms with stunning views. We also offer a spacious private self-catering apartment (up to 4 people) with private bathroom and kitchen. Either if you are tired after a long walk or just want to chill out and mingle with other travellers from all around the world, feel free to come and warm up by our cosy fireplace or enjoy the views from the garden (and what about a barbecue?). Our knowledgeable staff will always be happy to help you plan your trip in the Highlands or point you to the best places to check out in town. -FREE superfast fibre optic wi-fi throughout the hostel. Reception is open from 07:30 to 23:00. Check-in is from 15:00 to 23:00. You may arrive before check-in and store your bags for free. Late arrivals must advise reception as early as possible and a late check-in charge may be applied (£5 per half hour). Check out is until 11 am. - For the private rooms and the apartment, the price is per room per night and the entire room must be booked and for the 6 mixed dorm/ 4 mixed dorm/ 4 female dorm, all prices are per person, per night. - All under 17′s must be accompanied by an adult and be in a private room. - We cannot accept online bookings of more than 6 people or for more than 7 consecutive days. -- We are a tourist hostel and cannot accommodate stag/hen parties or groups of working people. Excellent hostel. The staff were exceptional host. The location is perfect. Bathrooms and the beds were super new and clean. Small and cozy...they even had a fire on in the main gathering space. Tavern next door is spot on and a short walk to the train station. Great place, very homely feel. All the staff were absolutely lovely. the fireplace was great, a good common area to meet other travellers. A pretty strong 'new paint' smell in the dorm (room 1) but understandable as they refurbished recently and it's worth it as the room and new pod beds were amazing, good privacy and very comfortable. This hostel was ideal while staying in Inverness! The location was only a few minutes from the main city center and it overlooked River Ness and the Castle!! So cool! The rooms are small, but this was only a minor issue when all the beds we’re booked. It was easy to escape the feeling of crowdedness by going downstairs to sit near the fire and chat with other travelers. Overall, this hostel was perfect. I would definitely stay here again! Great Hostel which meets a great standard from someone that is mature aged and has always gone hotel style but recently decided to discover a wider ‘world’. Only one grievance that I hope will not be repeated (discussed with desk staff) - that regardless of enthicity, appearance but in my case mature aged, one should not be looked over and disregarded due to ‘an image’ that a staff member redeem as ‘not worthy’. It is that ‘invisibility’ that deeply hurts!!!! Your understanding is appreciate. A cosy, clean place with comfortable beds and a good atmosphere throughout. It was quiet, although a minute’s walk into town and only ten minutes to the train station. The bathroom / shower room was very clean and I particularly loved the fire place downstairs - a great place to read and chill. Everything was great, loved the layout of the rooms. My only issue was that there were only few plugs available on the floor at the corner of the room, and there was only one toilet available for the entire floor. Decent location, great value for money, staff very friendly, clean, bed was comfy, I'd stay here again.